The worlds No.1 Non-Surgical Facelift treatment! Results driven but truly relaxing facials! All treatments are inclusive of consultation time. During each treatment all 32 muscles are gently manipulated and re-educated using a series of precise movements. Soft cotton tipped wands that are used on the face transmit a micro-current energy to restore tone and elasticity. A course of CACI is recommended to give long lasting affects. After one course you’ll never need another course, just a maintence facial every 4 - 6 weeks. Upon booking this course you pay for 9 and receive 1 free! Everything included in the CACI Facial with microdermabrasion exfoliation. Combines active micro current rollers with a unique, electrically conductive gel mask that has been infused with powerful hydrating properties. (collagen, hyaluronic acid and vitamins C & E) Leaving remarkably softer, radiant and a youthful appearance. 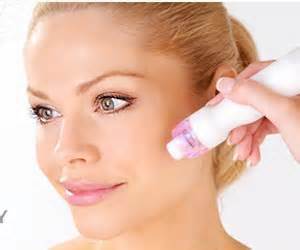 Targets the eye area to reduce lines, hydrate and stimulate blood flow around the area. Or Focusing on the jowl area to firm & tone the jaw line, quad probes, double the lifting, double the effect! CACI Newest Eye Treatment..... Soothes tired and puffy, Combats dark circles, Reduces fine lines and wrinkles and Lifts hooded eyes. Gently tightens and tone sagging muscles around the eye area, whilst reducing the appearance of fine lines and wrinkles. We offer this CACI jowl as an add on with any full CACI face treatment at a discounted price. Combines the micro current toning, microdermabrasion exfoliation, light therapy and hydra tone mask. Combining the CACI Ultimate treatment with the very best ingredients and techniques, giving you an instant lift and radiance.